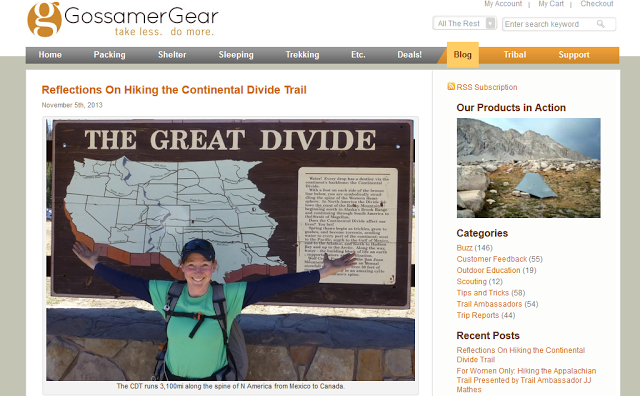 I wrote an exclusive independent article for Gossamer Gear that was posted today. It is a reflection on my though process and feelings about the Continental Divide Trail before, during, and after the hike. Just click here to read the full article posted on the Gossamer Gear website. I am a Trail Ambassador for Gossamer Gear and love the Mariposa Backpack I use of theirs. Gossamer Gear’s motto is, “take less. do more.” so they have some great ultralight gear on their site. Their site also has a great blog with articles from contributors like me, and links to the other Gossamer Gear Trail Ambassador websites. Enjoy!